Sally Fryer (ASE) is a Producer of Good Pitch² Australia, Senior Editor at Shark Island Productions and a Director of Shark Island Institute. She was a founding Director of the Documentary Australia Foundation. In 2011 she gained accreditation from the Australian Screen Editor’s Guild, and in 2012 was awarded an ‘Ellie’ by the Guild for Best Editing in a Documentary Feature for the film Paul Kelly – Stories of Me which also won the Film Critics Circle of Australia Award for Best Documentary in 2012. In 2008 she won the AFI Award for Best Editing in a Documentary for The Oasis – an observational feature documentary shot over two years about a group of severely disadvantaged kids who live on the streets of inner Sydney. 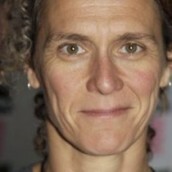 Working with Shark Island Productions since 2005 she was editor (with Hilary Balmond) of Suzy & The Simple Man, consulting editor on Stories From the Inside, editor of two short dramas, Polly and Me (a harrowing tale of child abuse and neglect, seen through the eyes of an 8 year old girl),and Wall Boy, In the Company of Actors – a feature documentary starring Cate Blanchett and Hugo Weaving, in which a company of actors reveals the magic and struggle of creating world class theatre, Alone Across Australia which was voted ‘one of the top 20 adventure films of all time’ and has now won over 25 international awards, and Woodstock for Capitalists which won several awards including a Cine Golden Eagle Award. Sally was a finalist for the Dendy Awards Best Documentary Category 2005 with Political Football and winner of the Australian Film Critics Award for Best Documentary in 2003 with The Original Mermaid. Her work has twice been nominated for an Emmy award and many, many years ago Watergate – a compelling 5 part series – won an International Emmy for Best Documentary series.